Garage rock duo the Kills have yet to share any concrete information about the new studio album they've been talking about since last year, but they've now expanded their live schedule into the fall with a new batch of North American dates. The outing is a brief one that takes places entirely in the final 10 days of October. In that time, the pair will play a number of U.S. shows, plus a single Canadian gig in Vancouver on October 26. There's also a Los Angeles date with Queens of the Stone Age. 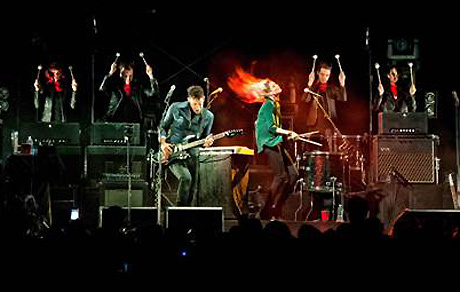 Meanwhile, the Kills have spent the summer so far playing shows. They've got a few more European dates this week. See the full schedule below. Tickets for the fall headlining appearances go on sale this Friday (July 18). An announcement confirms that the band are still working on their next album.